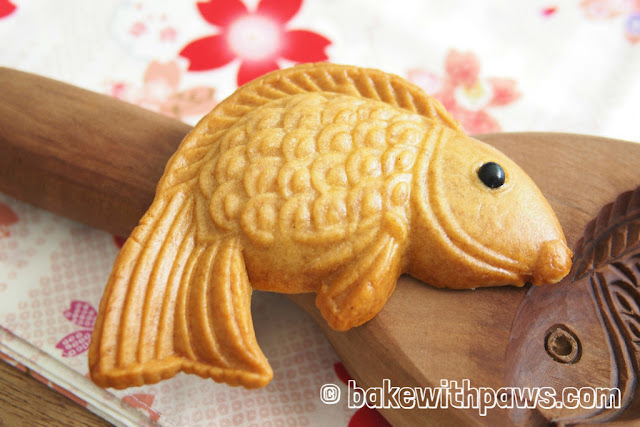 I noticed many home cooks have been attempting homemade mooncakes. I got inspired to try something traditional for the mid-autumn festival. 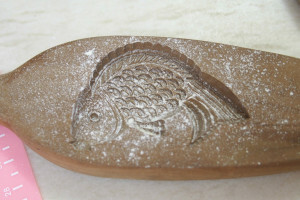 My mother in-law happened to have a beautiful mould carved out of wood I really wanted to use. 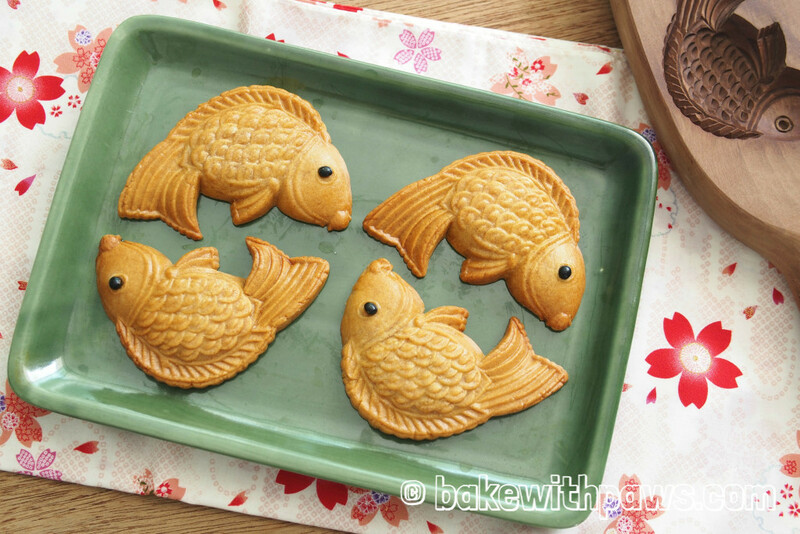 As it is my first attempt, I started with easy Mooncake Biscuits without filling. 1. Line cookie/ baking sheet with parchment paper or silicone mat and set aside. 3. 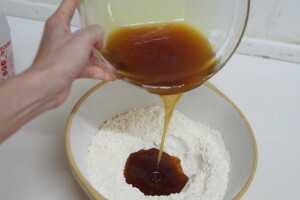 Sift all purpose flour in a large bowl, make a well in the center and pour in the sugar syrup mixture. 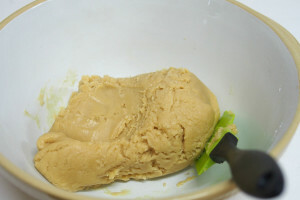 Using a rubber spatula to mix and form to a soft dough. ￼4. 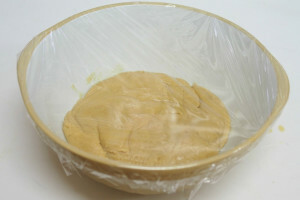 Cover the mixing bowl with the dough in it using cling wrap then set it aside in the fridge for at least an hour or overnight before using. ￼5. Lightly dust some flour on table and knead dough again till smooth. 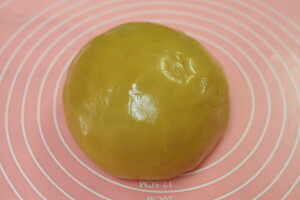 Measure dough to about 65g and roll it into a ball and dust some flour on it. ￼6. Dust the mould with some flour and press firmly into fish mould ~ unmould and place it on the lined baking tray. 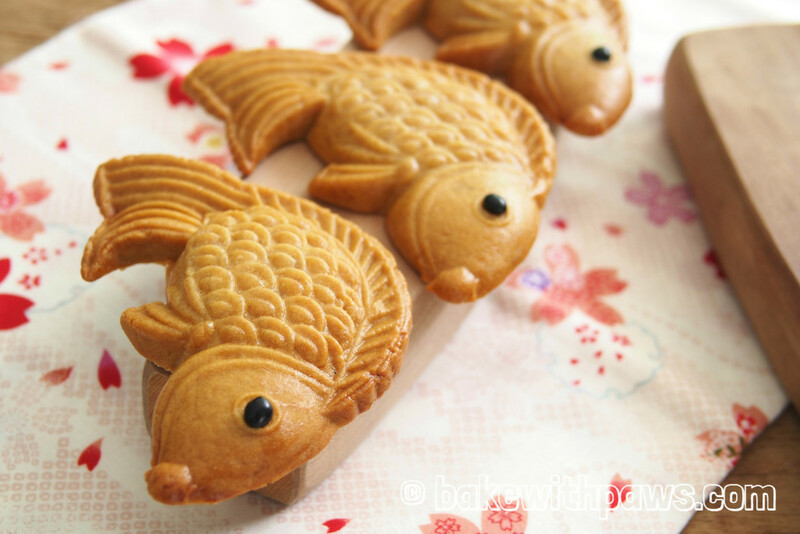 Press red bean as fish eye. To get even baking, do not place the unbaked fishes too closely. 7. Bake in the preheated oven 160C for 10 minutes. Remove from oven and let cool, on the baking sheet, for 10 minutes. 8. 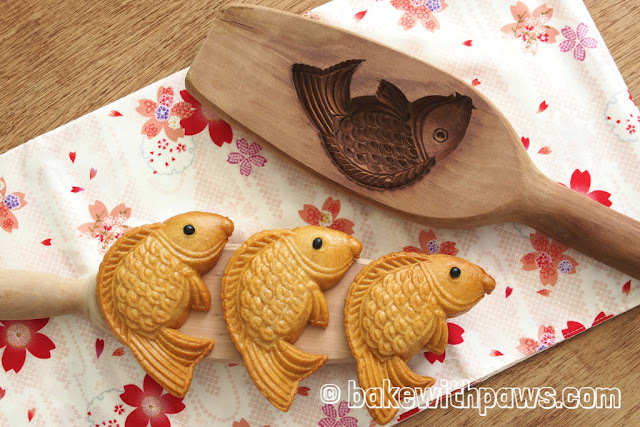 While the cookies are cooling, whisk together the egg yolk and 1 tablespoon of water to make an egg wash. Once the cookies have cooled for 10 minutes, brush lightly with the egg wash, taking care not to smooth out the edges of the design with the brush. 9. Bake for an additional 15 minutes or until golden brown. 10. Cool down biscuits and store them in an airtight container and and let them rest for at least 2 to 3 days before serving in order for the pastry to soften. For this recipe I used all purpose flour and sifted it twice as I do not have Hong Kong flour at home. I made my own golden syrup. 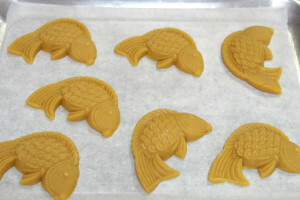 It is a kind of caramel made from cooking sugar, water and lemon together. Please refer to the recipe here. You may also buy ready-made golden syrup from the grocery stores. Alkaline water is a solution of potassium carbonate & sodium bicarbonate that you can find in grocery stores.